Many science classes, freshman orientations and team-building seminars use the egg-drop activity to build problem-solving and cooperation skills. 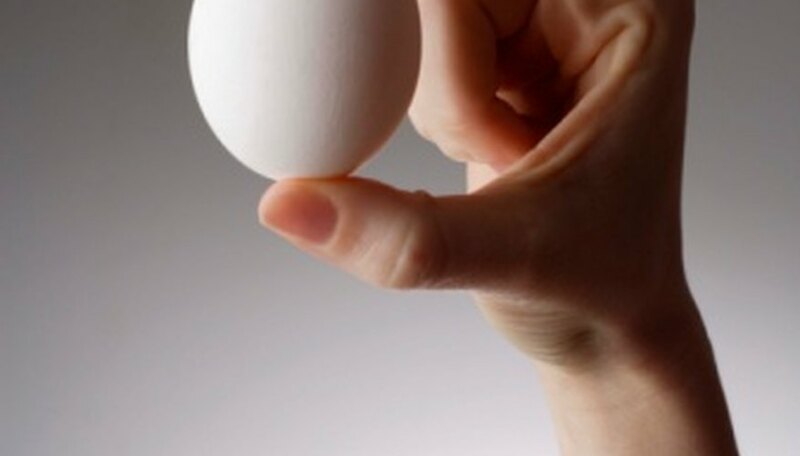 Participants must drop a raw egg from a certain height without cracking it. In some cases, you must use specified materials to protect the egg; in other cases you are allowed to use your own materials. If you have time to plan and gather your own materials, there are several ideas for keeping your dropped egg intact. Place your egg in a plastic sandwich bag with a zipper seal. Pack the bag with crispy, rice cereal to surround the egg and close the bag. Mark the outside of this bag, Egg. Fill four more sandwich bags with cereal and seal. Place the egg bag in a plastic, gallon-size bag, then pack the cereal bags around the egg bag, making sure the egg bag is in the center and well-protected. Seal the gallon bag and drop. Place a small rock in the bottom of a Styrofoam cup. Stack six more cups in the cup with the rock, and place your egg in the top cup. Add one last cup, resting it gently on top of the egg. Place several pieces of tape along the edges of the stack, so the cups do not come apart. Be sure the rock is heavier than the egg, so the stack will not tilt or turn upside-down while falling. Cut the leg off of a pair of pantyhose. Place the egg inside the leg toward the middle, about where the knee would be. Secure the hose at both ends of the egg with rubber bands to keep the egg from sliding around inside the hose. Stretch the ends of the pantyhose diagonally from corner to corner of a shoe box, so that the egg is suspended tightly above the center of the box. Staple the pantyhose ends securely to the box corners, so the egg is held taut. Cut a square of newspaper about 7 inches by 7 inches. Cut four long, thin strips of newspaper and attach one end of each strip with tape to each of the four corners of the newspaper square. Tape the other end of each strip securely to the egg, parachute-style. Based in Pittsburgh, Pa., Lori Keller began writing in 2010 and has been a freelance translator since 2001. Her work has appeared on eHow. Keller has a Bachelor of Arts in French from the University of Pittsburgh.